Once again we are grieving lives lost senselessly to gun violence. The lives lost just this week to hate crimes and racially motivated violence perpetrated with a gun is heart wrenching and tragic. Our faithful response to these events is to come together – support our community and one another. All across the countries vigils were held in honor and memory of the lives lost. Campaigning season is upon us- and with that comes political ads in all shapes and sizes. We’re inundated with television commercials telling us which candidate supports which issues and now with social media there are more places to be targeted for political ads. 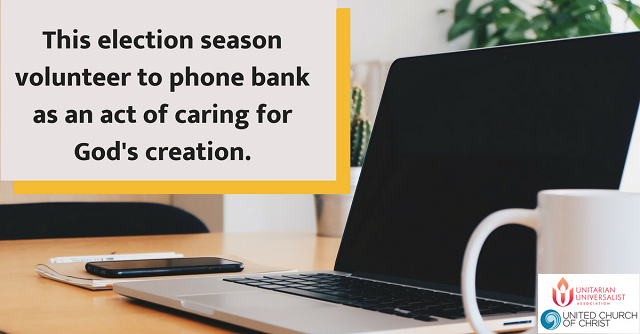 There is a non-partisan way that people of faith can make a difference this election season: phone banking. At notable rates, those who care about the environment fail to vote compared to the rest of the population. All of this can change when those who care about the environment receive a phone call or text reminding them to vote. We are confronted with injustice every day and sometimes the problems of our world seem too big to confront. But our faith is infused with hope and built on a foundation of action. While it is tempting to disengage from the political process, as people dedicated to creating a just world for all we know that we cannot. One of the best ways we can work for change is by voting. Not convinced? Here are 9 reasons that you should vote (and tell your friends to vote too).